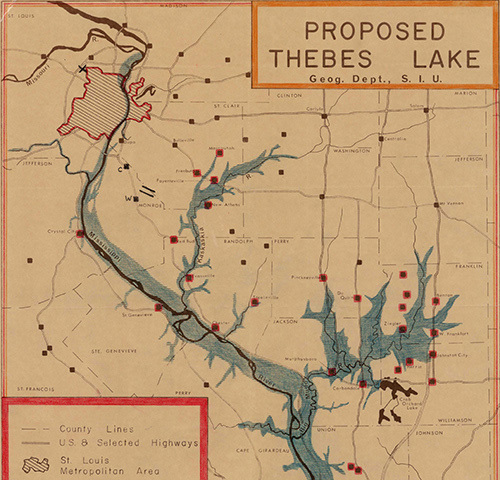 CARBONDALE, Ill. — Did you know there was once a proposal floated to create a Thebes Lake in Southern Illinois? The location of this lake that didn’t happen, as well as all kinds of other curious and vital information – from details about flood prone areas to coal mine locations in Southern Illinois – can now be found online, thanks to Southern Illinois University Carbondale’s Morris Library. More than 850 maps from the library’s collection have been digitalized and can now be seen at http://collections.carli.illinois.edu/cdm/landingpage/collection/sic_maps. The Maps of Southern Illinois Online collection covers the city of Carbondale and the rest of Jackson County as well as other Southern Illinois counties. Included are maps showing county roads, land ownership, proposed developments, aerial photographs, and coal, oil and gas mining maps. Anyone may view the maps at no cost. The maps can serve a wide variety of purposes, according to Pam Hackbart-Dean, director of Morris Library’s Special Collections Research Center. “This collection can be used to study historical settings, trace locations through time, track place name changes and for other things,” Susan Tulis, associate dean of Library Affairs, said. Numerous library staff members worked to create the valuable online resource. The project was supported in part by an Illinois State Historical Records Advisory Board award through funding from the National Historical Publications and Records Commission, a component of the National Archives and Records Administration. A Morris Library project digitalized more than 850 current and historical maps. All are available for free viewing by the public at: http://collections.carli.illinois.edu/cdm/landingpage/collection/sic_maps. Media Contact: Pam Hackbart-Dean, director of Morris Library’s Special Collections Research Center, at 618/453-1452 or phdean@lib.siu.edu.